I recently showed a friend this blog for the first time and the title that popped out at her from the list was The Tender Bar, a memoir by J.R. Moehringer. She told me she’d heard it was good. Well, that was a good enough reason for me to make it next in the queue. A moving, vividly told memoir full of heart, drama, and exquisite comic timing, about a boy striving to become a man, and his romance with a bar. J .R. Moehringer grew up listening for a voice: It was the sound of his missing father, a disc jockey who disappeared before J.R. spoke his first words. As a boy, J.R. would press his ear to a clock radio, straining to hear in that resonant voice the secrets of masculinity, and the keys to his own identity. J.R.’s mother was his world, his anchor, but he needed something else, something more, something he couldn’t name. So he turned to the bar on the corner, a grand old New York saloon that was a sanctuary for all types of men-cops and poets, actors and lawyers, gamblers and stumblebums. The flamboyant characters along the bar-including J.R.’s Uncle Charlie, a Humphrey Bogart look-alike; Colt, a Yogi Bear sound-alike; Joey D, a soft-hearted brawler; and Cager, a war hero who raised handicapping horses to an art-taught J.R., tended him, and provided a kind of fatherhood by committee. When the time came for J.R. to leave home, the bar became a way station-from his entrance to Yale, where he floundered as a scholarship student way out of his element; to his introduction to tragic romance with a woman way out of his league; to his stint as a copy boy at the New York Times, where he was a faulty cog in a vast machine way out of his control. Through it all, the bar offered shelter from failure, from rejection, and eventually from reality-until at last the bar turned J.R. away. Riveting, moving, and achingly funny, The Tender Bar is at once an evocative portrait of one boy+s struggle to become a man, and a touching depiction of how some men remain lost boys. I started it on the plane this past weekend and I’m already hooked. This entry was posted in About the Books and tagged jr moehringer, memoirs, the tender bar. Bookmark the permalink. Growing up in the comforts of the upper middle class might have afforded us many opportunities, but while our family friends are the nicest, funniest people around, we never had a chance to meet such colorful folk like a Humphrey Bograt look-alike. It will make my future memoir very boring. I guess I will have to James Frey-it up a bit. 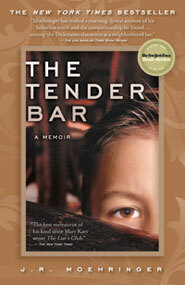 I was sitting across from a girl reading The Tender Bar on the train to work Monday morning! I stared at her creepily and tried to remember what it was about, but I knew I’d heard good things. And then I saw this post, so it was obviously fate rather than creepiness. Also, if you got any reading done on the plane home on Sunday, I’m very impressed. To send me thoughts, suggestions or heaps and heaps of praise, feel free to email readingforrobin@gmail.com. I'm participating in The Walk to Defeat ALS again! The event takes place on May 14 in New York. If you're interested in giving, please visit my personal fundraising page. Thank you!